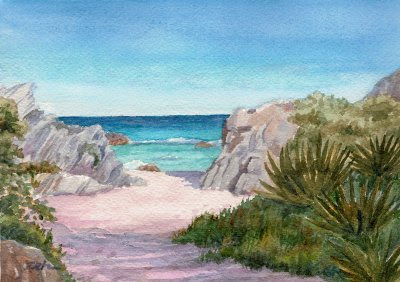 This painting is #27 of the Bermuda Collection. The south shore of Bermuda is lined with coral cliffs. We took a walk on some of the trails along the beach, sometimes high above the beach along the tops of the cliffs. At one point, I stopped, having brought my paints, and let the others go on ahead while I sat in the sun painting, battling with the breeze to keep my painting from blowing away. I'd found a place with two stumps next to each other which made a perfect place both to sit and to put my pallette. I did a painting very similar to this one. It was lovely sitting there in such a beautiful spot!